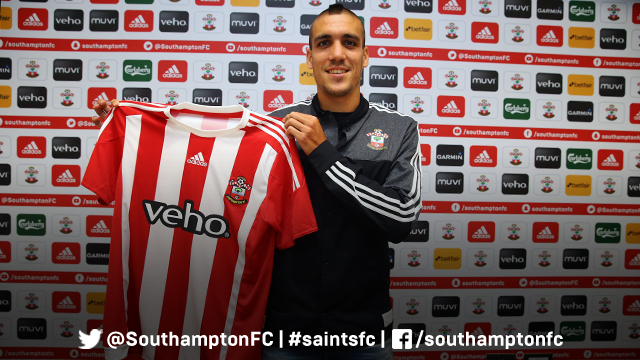 On the 12th August, in a move that was completely unexpected, Saints announced the signing of 23 year old Spanish midfielder Oriol Romeu on a three-year deal. He moves from Chelsea, after joining them in 2011 from Barcelona, where he had been in their famous academy at La Masia. Romeu was a team-mate of Ryan Bertrand, when Chelsea won the Champions League in 2012 and the Europa League the following year. He had injury problems, which resulted in him being sent on loan to Valencia the season before last and rather more successfully at VfB Stuttgart last season. Les Reed was quoted as saying : “We are extremely happy to be able to bring Oriol to the club on a permanent basis." “Once again, we are demonstrating our commitment to compete seriously on all fronts this season by continuing to build a squad with depth and quality." “Oriol is a player we have had on the radar for some time – he was a prominent figure in the Chelsea team of 2011/12, when he made 24 appearances as a 20 year-old." “Like Ryan Bertrand, we believe we have recruited another Chelsea player with an excellent pedigree but also with lots of potential to develop." “He is another player who matches the Southampton profile – he is young and hungry, has been developed at a top academy and has already played at the highest level with plenty more to come." It is clear that the club has been tracking him for some time and he is seen as being a key signing for the future of the club.